The Springfield Regional Chamber of Commerce staged its annual Super 60 Luncheon at a packed Chez Josef in Agawam on Oct. 28. Now in its 28th year, the program recognizes high-performing companies in two categories: Total Revenue and Revenue Growth. 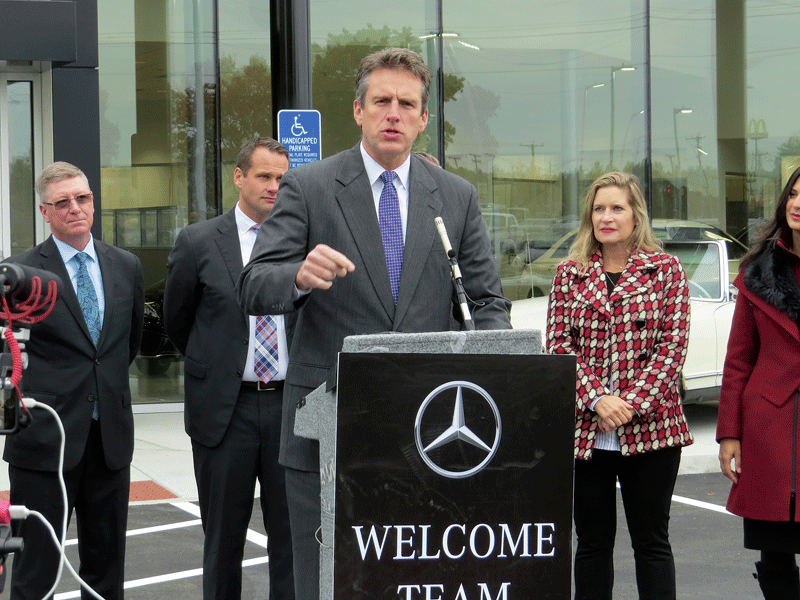 A host of local and state officials were on hand on Nov. 1 for the ribbon cutting for Mercedes-Benz of Springfield, the $12 million dealership created at the site of the former Plantation Inn in Chicopee. 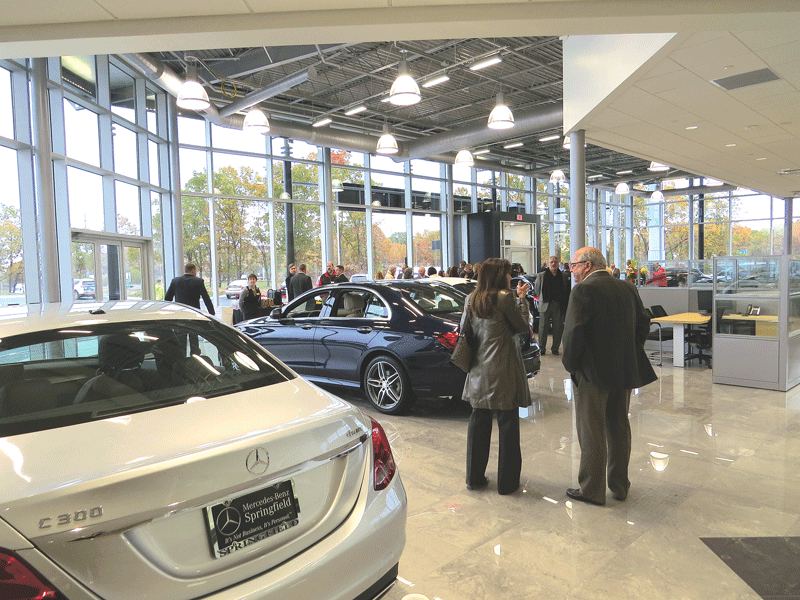 First conceived nearly three years ago, the dealership marks the return of Mercedes-Benz to the Greater Springfield area after a decade-long absence. SPRINGFIELD — Ralph Crowley Jr., president and CEO of Polar Beverages, will serve as the keynote speaker at the Springfield Regional Chamber’s Super 60 event on Friday, Oct. 27. Now in its 28th year, the program celebrates the success of the fastest-growing and privately-owned businesses in the region which continue to make significant contributions to the strength of the regional economy. Worcester-based Polar Beverages was founded by Crowley’s great-grandfather, Dennis Crowley, in 1882, primarily as a wholesale and retail liquor business. However, prohibition put a stop to the family’s liquor sales, forcing them to focus on bubbly waters and bottled water instead. Under the entrepreneurial and visionary leadership of fourth-generation Ralph Crowley Jr., Polar Beverages has grown to be the largest privately owned soft-drink bottler in the U.S., having completed more than 30 acquisitions, including proprietary brands Adirondack, Waist Watcher, Clear ‘n’ Natural, and national brands 7Up, A&W, Sunkist, Seagram’s, Royal Crown, and Diet Rite, along with new-age brands Snapple, AriZona, Fiji Water, O Water, HyDrive, and Nantucket Nectars. Polar also bottles home and office water. In September 2001, Polar Beverages formed a joint venture with Cott Corporation. 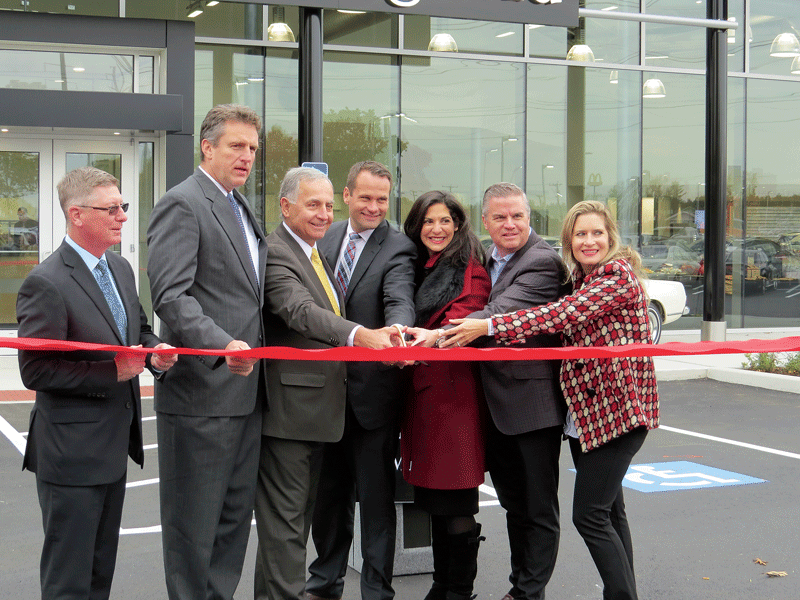 The partnership is known as Northeast Retailer Brands, LLC. This joint-venture partnership produces and distributes most of the retailer-branded beverages in the Northeast. At one time, Polar Beverages maintained a warehouse in Springfield. The Super 60 Celebration event honoring this year’s class will be held from 11:30 a.m. to 1:30 p.m. at Chez Josef, 176 Shoemaker Lane, Agawam. Reservations are required. The cost is $60 for members, $75 for general admission. Reservations may be made for tables of eight or 10. The deadline for reservations is Oct. 18. No cancellations will be accepted after that date, and no walk-ins will be allowed. Reservations may be made online at www.springfieldregionalchamber.com or by e-mail to [email protected]. 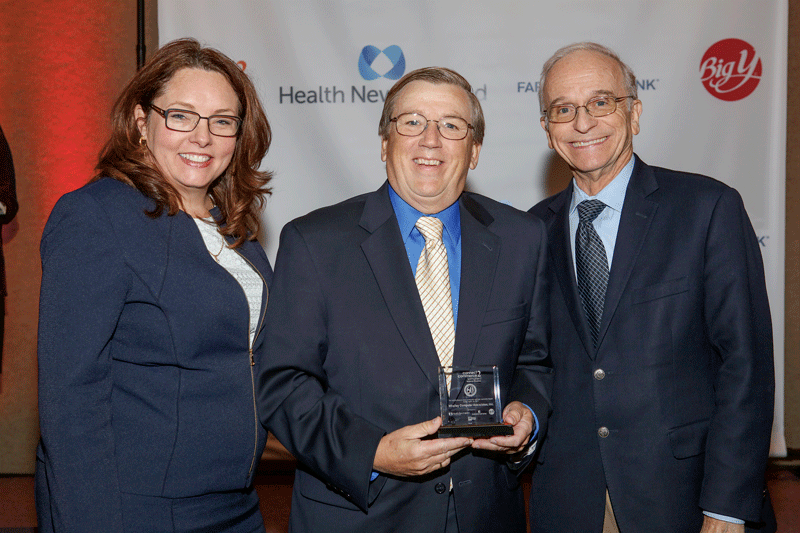 The Super 60 event is presented by Health New England and sponsored by Farmington Bank. The event is also sponsored by the Republican, the Regional Employment Board of Hampden County, and Zasco Productions. Ted Noonan says he’s extremely proud of his family history and the company that was started by his great-great-grandfather in 1890, and is doing his part to add to that legacy. His father, Ed, introduced him to Noonan Energy at age 7 and served as a role model who inspired him to become active in the industry. Noonan pumped diesel fuel in his youth, drove an oil truck in high school, joined the company as a full-time employee in 1998, and worked his way up to the role of president. Under his leadership, the company has acquired several oil companies, started a plumbing division, and further diversified into home-energy audits and providing lighting improvements and air sealing through the Mass Save program. Noonan overhauled the company’s service department, streamlined the dispatch system and fleet, and spearheaded the company’s transition to Bioheat fuel, advocating for its use, he says, because it is better for the environment. 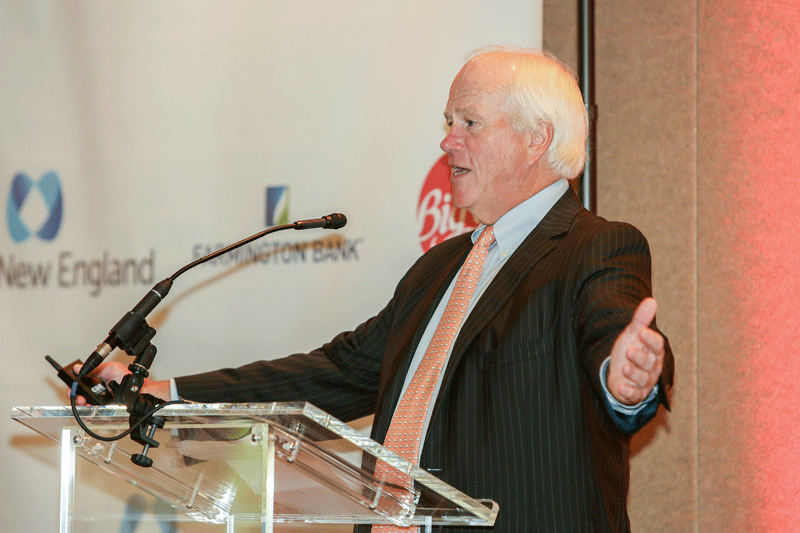 He has been interviewed by trade publications regarding the proposed natural-gas pipeline expansion in New England, is immediate past chairman of the board and current board member of the Mass. Energy Marketers Assoc. (MEMA), is an executive committee board member and vice chair of the New England Fuel Institute, and advocates for his industry in Washington, D.C. 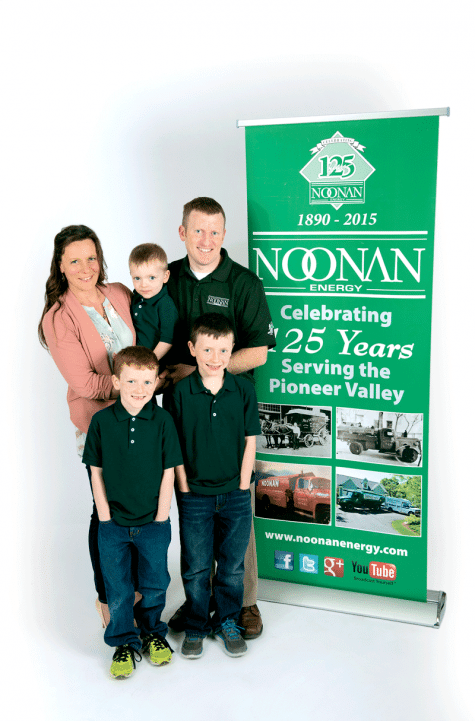 In 2013, the Springfield Regional Chamber of Commerce named Noonan Energy a Super 60 company, and Noonan and his father were feted with the Industry Leadership Award by MEMA. He served as corporator for Country Bank from 2013 to 2016 and is on its board of trustees. Noonan Energy supports many charitable organizations, including the Gray House in Springfield and others that provide discounts for fuel deliveries. The company also supports local sports teams and has donated four $250 gift certificates as part of the Noonan Warm Wishes contest on 94.7 WMAS. Jill Monson-Bishop says women who own businesses can benefit from creating a team of advisors who can support them. That famous quote from Oprah Winfrey — “Follow Your Passion: It is What Will Lead to Your Purpose” — is emblazoned in oversized letters on a wall in the waiting room of Inspired Marketing Inc. in Springfield. The quotation is in line with the belief system embraced by the company’s self-named ‘chief inspiration officer,’ Jill Monson-Bishop, a title she put on her business card when she established her full-service advertising company, then went on to hire team members with a driving desire to help clients realize their goals. The climate within the office was also carefully orchestrated: there are three dogs on-site most days; they sport the titles ‘employee satisfaction manager,’ ‘customer experience associate,’ and ‘siesta manager.’ Everyone has a pair of comfortable slippers under their desk, and not only is collaboration encouraged, milestones of any kind are announced and celebrated. It’s a formula that has led to success: Over the past three years Inspired Marketing has retained 93% of its clients and increased revenue by 362%. 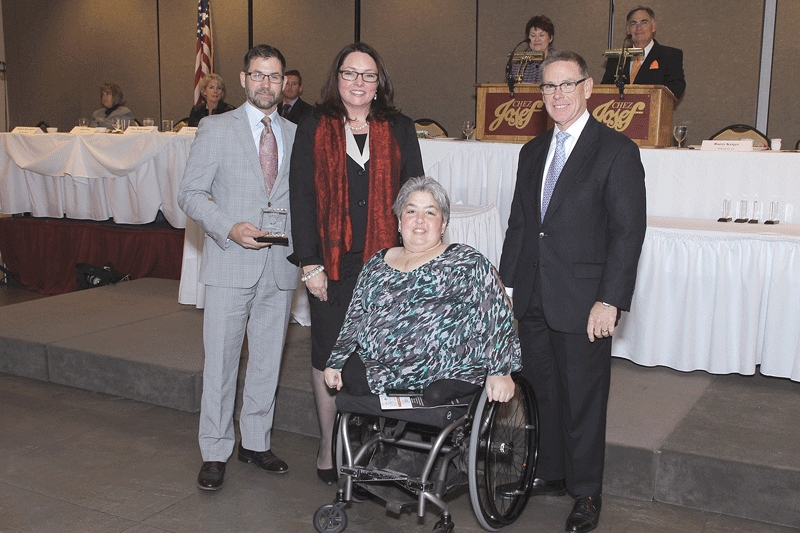 Indeed, awards have been forthcoming: One client was feted with a Better Business Torch Award; others were finalists for the honor; and still others have been named Super 60 companies by the Springfield Regional Chamber of Commerce for revenue and revenue growth. Monson-Bishop tells new clients she doesn’t just want to purchase media for them, create a logo, or do graphic design; instead, she wants to be part of their team. That vision has materialized, and one business sends her their weekly sales report. “I’m part of their growth or struggle depending on the week,” she noted. 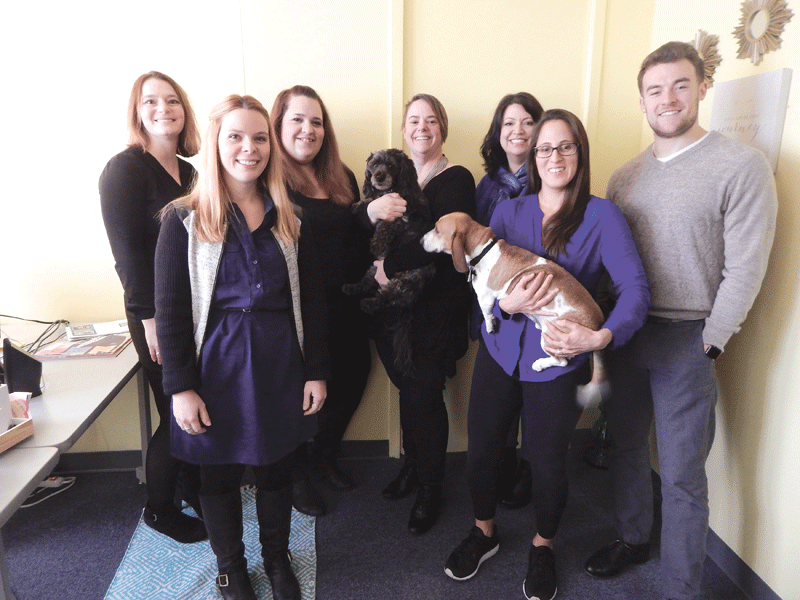 She took pride in the fact that one client, the Good Dog Spot was recently able to open a second location, which was among its goals, and says she and her team have been invited to a number of company holiday parties. Team members at Inspired Marketing have increased revenue over the past three years by 362% and retained 93% of their clients. One thing she focuses on is creating synergistic relationships between clients. For example, when Square One needed a pizza donation, she approached Frankie and Johnnie’s Pizzeria. Today the restaurant donates pizza to the non-profit once a month and employees and families involved with Square One frequent the eatery and buy lunches there, which they hadn’t been doing in the past. In addition, Frankie & Johnnie’s will cater an event for Square One next year. 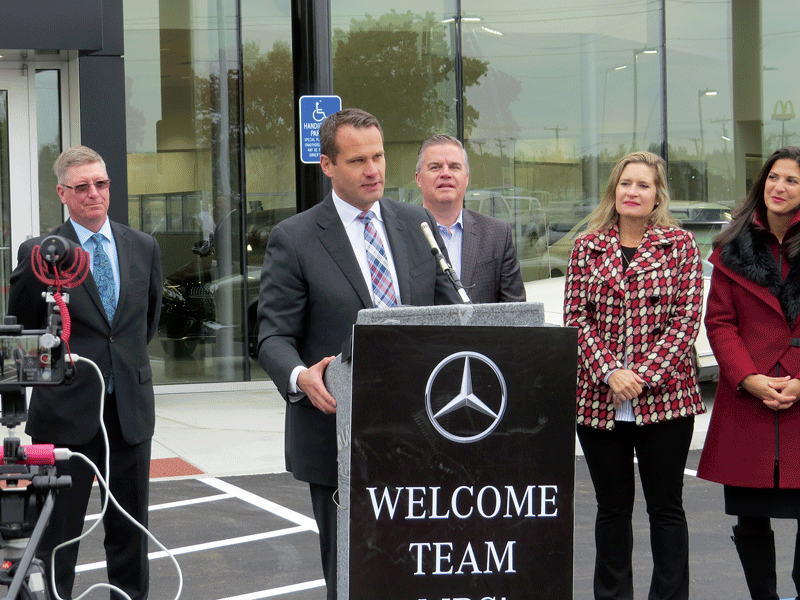 Another example is a collaboration between Bob Pion Buick GMC; Square One; and the American International College Men’s –D1 Ice Hockey team. AIC had planned to stage a toy drive at a December ice hockey game, and, thanks to Inspired Marketing, Bob Pion has volunteered to donate a truck, the toys will go to Square One, and every donor will receive a ticket to another AIC hockey game. Monson-Bishop says starting her own business has been the most difficult and rewarding thing she has ever done. Monson-Bishop had worked as a radio broadcaster, and when her mother passed away she was selling coupon advertising and making more money than she ever had in her life. “But I didn’t want my legacy to be selling 50% off pizza coupons,” she said. “I enjoyed working with clients and had found that small and medium-sized businesses were not being served by advertising agencies. Many were good at what they did but they had no idea how to spend money effectively on marketing,” she noted, explaining that the belief was reinforced by Butler Carpet & Upholstery Cleaning, which had been in business for 30 years, and became her first client. 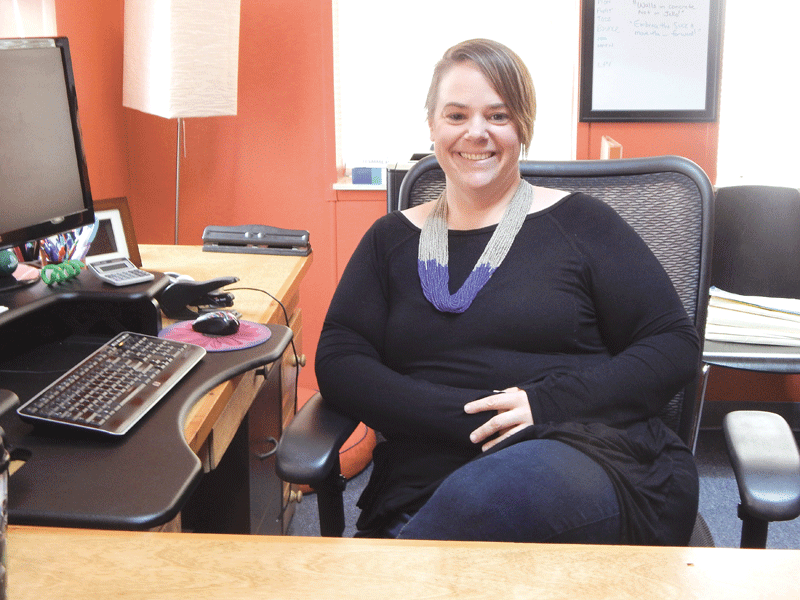 Monson-Bishop launched her new venture by renting a desk in a friend’s Springfield office. She moved to Agawam after hiring one part-time employee; then moved back to Springfield two years ago, which is a city she truly loves. “I just purchased a Victorian in the Historic McKnight area, and believe the city is on the cusp of a renaissance. Great things are happening and I want to be part of them,” she said, noting that she also owns another house in the City of Homes. Today Inspired Marketing has five team members in addition to Monson-Bishop and gets help from two interns every college semester. Their business is split equally between marketing and events, and clients include Smith & Wesson; Northwestern Mutual, American International College and the City of Springfield School Department; as well as smaller businesses. They also work with a number of nonprofits including Valley Venture Mentors and the Zoo in Forest Park. “They do so much for us and we need to support them,” Monson-Bishop said, noting that last year, Inspired Marketing staged a Tiny Tea to celebrate the 10th anniversary of Square One’s popular fundraiser. Dignitaries included Springfield Mayor Domenic Sarno and Holyoke Mayor Alex Morse who enjoyed tea seated at a child’s table. They wore hats and the event attracted a lot of media attention. The crew also takes pride in coming up with creative advertising ideas. When they did a campaign for one non-profit they mailed reading glasses to potential donors with a note that said, “See the difference we can make,” then went on to explain the charity’s mission. Monson-Bishop believes female entrepreneurs face challenges unique to their gender. Her own accomplishments are significant: not only has she grown from a sole entrepreneur to a thriving advertising firm; she lost 125 pounds 3 1/2 years ago, has kept it off and been sugar-free for more than 1,200 days; was chosen as a BusinessWest 40 Under Forty 2010 class member, among other honors. When she was notified about the most recent award, “I only celebrated for about 10 seconds,” she said, adding that she believes it’s easier for women to praise other people’s accomplishments and victories than take pride in their own. “We tend to beat ourselves up for mistakes and need to learn to celebrate our own accomplishments and say ‘thank you’ when we receive a compliment,” she noted. She believes her weight loss has led business professionals to take her more seriously and is now able to purchase a professional wardrobe, which was difficult to do when she was 125 pounds heavier. Monson-Bishop has an advisory board composed of 10 local business leaders who have guided her over the years by providing honest and critical input. She shares her financial information with them and believes every female business owner could benefit from creating her own confidential circle of supporters. “When you have a hard day or have to make a difficult decision, it helps to have someone to talk to, and that person isn’t always your spouse,” she said. The founder of Inspired Marketing also feels many women suffer from what she calls the “Wizard of Oz Syndrome,” which is her metaphor for the imposter syndrome. “The world may see you as the big and powerful Oz, but sometimes you feel like the man behind the curtain who is afraid to have it pulled back and be found out,” she said. But testimonials from clients say that Monson-Bishop and her crew are truly inspired, have the ability to attract attention and help clients succeed. Monson-Bishop not only used personality and drive as criteria when she began hiring people, today when a new position is created all team members are included in interviews with prospective job candidates to ensure they are a good fit. Heather Ruggeri was thrilled the team chose her to be vice president and chief events officer, even though her credentials didn’t exactly match the job description. “But she had a willingness to learn; a desire for absolute customer satisfaction and it was evident that she was deeply loyal. She didn’t want a job, she wanted to be part of something,” Monson-Bishop said, adding that Ruggeri is one of many team members whose professional achievements have made her proud. Kristin Carlson was hired immediately after graduating from Fitchburg State University, and says her fellow team members have become like family and whenever they reach a goal, it is viewed as cause for celebration. That enthusiasm is generated by passion and the purpose that Monson-Bishop has found since she started her business venture. “You only get one chance at life, and this is it,” she said. 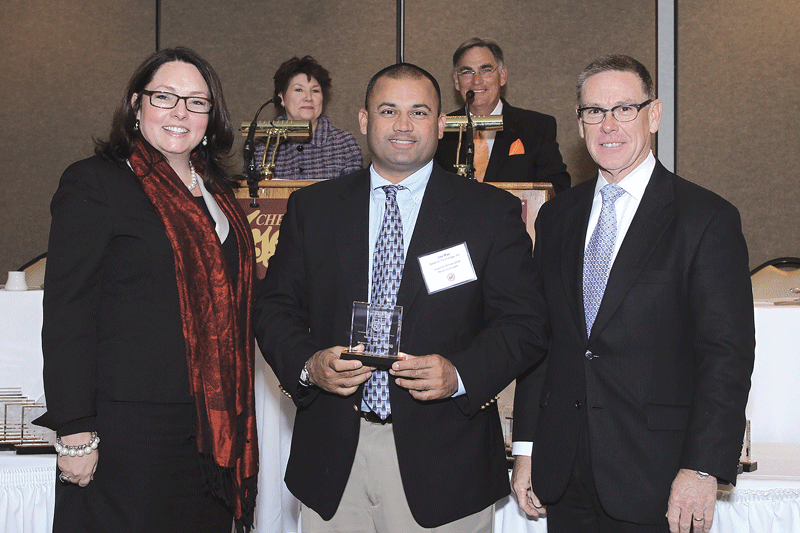 More than 500 guests gathered at Chez Josef in Agawam on Oct. 28 for the Super 60 awards luncheon, presented by the Springfield Regional Chamber to honor the region’s fastest-growing privately owned companies. 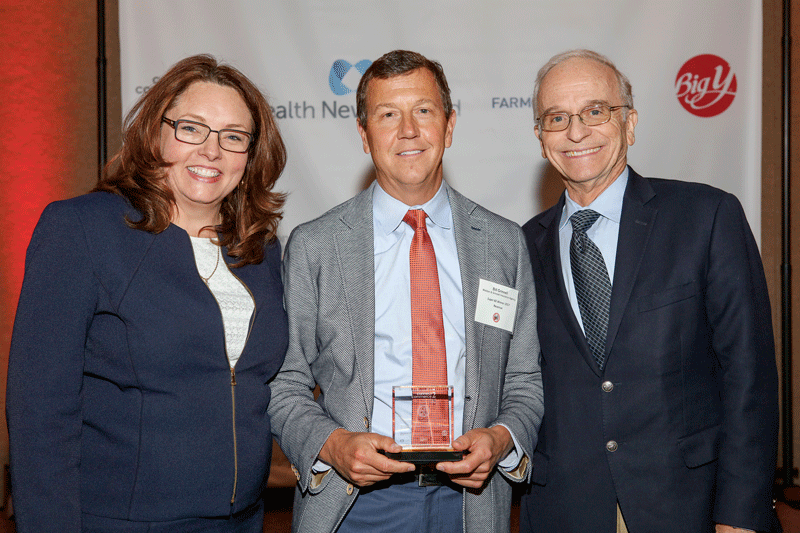 This year’s top honoree in the Total Revenue category was Stavros Center for Independent Living Inc. in Amherst, while the top honoree in Revenue Growth was Lavishlyhip, LLC in Feeding Hills. The event’s keynote speaker was Tree House Brewing co-founder Dean Rohan. 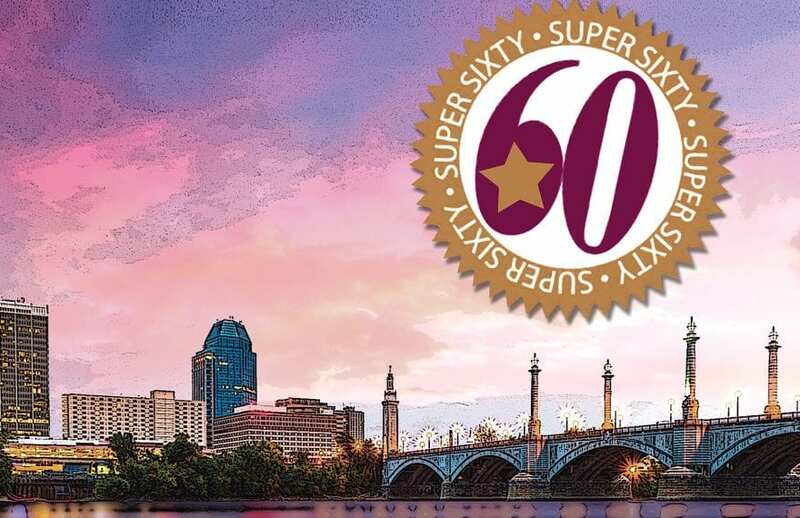 SPRINGFIELD — Time is running out to submit nominations for the Springfield Regional Chamber’s annual Super 60 awards program. The deadline is this Friday, Aug. 12. Now in its 27th year, the awards program celebrates the success of the fastest-growing privately owned businesses in the region, which continue to make significant contributions to the strength of the regional economy. Each year, the program identifies the top-performing companies in revenue growth and total revenue. Last year, total-revenue winners combined for revenues of more than $1 billion, with only-third of winners exceeding revenues of $30 million. All winners in the revenue-growth category had growth in excess of 20% while one-third experienced growth in excess of 65%. To be considered, companies must be based in Hampden or Hampshire county or be a member of the Springfield Regional Chamber, produce revenues of at least $1 million in the last fiscal year, be an independent and privately owned company, and have been in business for at least three full years. Companies are selected based on their percentage of revenue growth over a full three-year period or total revenues for the latest fiscal year. Companies may be nominated by financial institutions, attorneys, or accountants, or be self-nominated. Companies must submit a nomination form and provide net operating revenue figures for the last three full fiscal years, signed and verified by an independent auditor. All financial information must be reported under generally accepted accounting principles and will be held and considered confidential and not released without prior approval. Nomination forms are available here or by contacting Kara Cavanaugh at [email protected] or (413) 755-1310. The Super 60 awards will be presented in partnership with the East of the River Five Town Chamber of Commerce at the annual luncheon and recognition program on Friday, Oct. 28 from 11:30 a.m. to 1:30 p.m. at Chez Josef in Agawam. BOSTON — In the latest display of its R&D firepower, the University of Massachusetts vaulted to 30th globally in the Top 100 Worldwide Universities Granted U.S. Patents in 2015. Winning a record 62 U.S. patents arising out of faculty inventions, UMass placed third in Massachusetts and New England and was tied for 24th place among American universities. “Our faculty continues to shine with cutting-edge research and innovation that places us in the top tier of universities in the world. They lead us to new frontiers of human understanding, and their work opens the door to a more prosperous economic future,” President Marty Meehan said. “We’re proud of this accomplishment because today’s patent is tomorrow’s job-creating startup technology company.” The patents awarded are based on UMass research in areas as diverse as gene silencing, high-technology textiles, polymers, and nanotechnology, according to Abigail Barrow, interim executive director of the university’s Office of Technology Commercialization and Ventures. The 62 patents represent a 55% increase over the 40 awarded to UMass in the previous year and is the highest number issued in a single calendar year since UMass began its technology-transfer program in 1995, she added. UMass is also a national leader among universities in licensing income earned on its patented inventions. “Congratulations to the University of Massachusetts for making the Top 100 again this year and for an impressive increase,” said Paul Sanberg, president of the National Academy of Inventors, which produces the rankings along with the Intellectual Property Owners Assoc. One of the UMass patents relates to Geckskin, a super-strong adhesive discovered at UMass Amherst that can be used multiple times without losing effectiveness. This year’s top 10 ranked universities worldwide were: the University of California system, Massachusetts Institute of Technology, Stanford University, the University of Texas, Tsinghua University (China), California Institute of Technology, Wisconsin Alumni Research Foundation, Johns Hopkins University, Columbia University, and University of Michigan. The rankings are calculated using data from the U.S. Patent and Trademark Office. UMass is on pace to match or modestly exceed its record 62 patents in the next report, Barrow said. “Our impressive patent numbers reflect the rapid growth and influence of UMass’ research enterprise and the discovery going on at all of our campuses.” UMass shares the number-30 spot with the University of Utah Research Foundation and the Research Foundation of the State University of New York. The National Academy of Inventors is a nonprofit organization of U.S. and international universities and governmental and nonprofit research institutions with more than 3,000 members. The Intellectual Property Owners Assoc. is a trade association of owners of patents, trademarks, copyrights, and trade secrets. This is the fourth year they have collaborated to issue the rankings report. 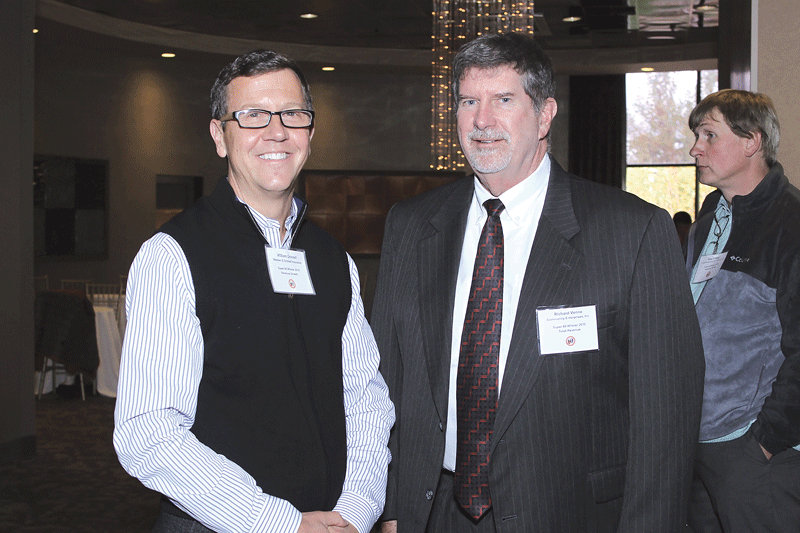 SPRINGFIELD — The Springfield Regional Chamber is seeking nominations for its annual Super 60 awards program. Now in its 27th year, the awards program celebrates the success of the fastest-growing privately owned businesses in the region, which continue to make significant contributions to the strength of the regional economy. Each year, the program identifies the top-performing companies in revenue growth and total revenue. Last year, total-revenue winners combined for revenues of more than $1 billion, with only-third of winners exceeding revenues of $30 million. All winners in the revenue-growth category had growth in excess of 20% while one-third experienced growth in excess of 65%. To be considered, companies must be based in Hampden or Hampshire county or be a member of the Springfield Regional Chamber, produce revenues of at least $1 million in the last fiscal year, be an independent and privately owned company, and have been in business for at least three full years. Companies are selected based on their percentage of revenue growth over a full three-year period or total revenues for the latest fiscal year. Companies may be nominated by financial institutions, attorneys, or accountants, or be self-nominated. Companies must submit a nomination form and provide net operating revenue figures for the last three full fiscal years, signed and verified by an independent auditor. All financial information must be reported under generally accepted accounting principles and will be held and considered confidential and not released without prior approval. Nomination forms are available here or by contacting Kara Cavanaugh at [email protected] or (413) 755-1310. Nominations must be submitted no later than Friday, Aug. 12. The Super 60 awards will be presented in partnership with the East of the River Five Town Chamber of Commerce at the annual luncheon and recognition program on Friday, Oct. 28 from 11:30 a.m. to 1:30 p.m. at Chez Josef in Agawam. SPRINGFIELD — On Friday, July 15, the Springfield Central Cultural District (SCCD) will be one of three statewide districts to launch Futurecity Massachusetts, a new approach to transforming cities that puts art, culture, and creativity at the center of redevelopment and revitalization. Futurecity Mass is a joint initiative of the Massachusetts Cultural Council (MCC) and the Boston Foundation. Futurecity Massachusetts will work with mayors, urban planners, and arts and business leaders in Boston, Worcester, and Springfield on key real-estate projects in state-designated cultural districts in the three cities, targeting areas ready for development and job growth. It is the first U.S. effort to advance the strategies of Mark Davy and his London-based Futurecity, which has created more than 200 partnerships across the globe that reposition cultural assets from community amenities to marketplace drivers. Futurecity has been immersed in cultural placemaking projects for more than a decade, and Davy believes Futurecity Massachusetts will secure the Commonwealth’s global position as a cultural leader. Davy will visit Springfield on July 15 to meet and workshop with local cultural and economic-development leaders. He will take knowledge from a walking tour of the Cultural District, an extensive workshop, and a general reception back to his UK team to review. In October, Futurecity will return to present a strategy to the Springfield public. The MCC hopes to eventually expand the program statewide. A press event will take place at 9:30 a.m. on Friday with Davy, MCC Executive Director Anita Walker, Mayor Domenic Sarno, and SCCD Executive Director Morgan Drewniany on the steps of City Hall. Both press and the general public are invited to attend. The Springfield Central Cultural District, which encompasses an area of the metro center of Springfield, is membership-based, involving many of the downtown arts institutions. Its mission is to create and sustain a vibrant cultural environment in Springfield. CHICOPEE — Junior Achievement of Western Massachusetts (JA) and 33 volunteers from area banks, businesses, and colleges teamed up to bring Junior Achievement programs to all 436 students at Fairview School in Chicopee for last month’s JA in a Day event. “This is the sixth year that Chicopee Savings Bank Foundation has sponsored JA in a Day for these students,” noted Jennifer Connolly, president of Junior Achievement of Western Massachusetts. “The students and teachers look forward to ending their year with JA, and Junior Achievement looks forward to ending our year with this terrific school. Nowhere else are our JA Volunteers treated to a final assembly with hundreds of cheering students and handmade cards and notes. It is an amazing event.” This year, JA volunteers from Chicopee Savings Bank, Bank of America, Santander Bank, Westfield Bank, Webster Bank, TD Bank, Babson Capital, Elms College, UMass Amherst, and Lead Yourself Youth brought Junior Achievement programs to students in grades K-5 at Fairview School. Carlos DeLeon, a Chicopee Savings Bank volunteer, noted, “the students had a good understanding of how a city runs. They had a great understanding of a savings account, and we talked about how taxes help the city rebuild.” Erika Eisnor, a Santander volunteer who taught JA Our Region in a fourth-grade class, noted that “JA is so much fun and a great learning experience.” Added Kidon Gebersadik from Bank of America, “it’s never too early to learn about good money habits. These exceptional students are learning about building blocks that will lead to more stable financial lives down the road, making our communities and local economies stronger.” Tim Dominick, a teacher at Fairview School, explained that the program “further offered the students a chance to explore their creative thinking process. The students benefited from the teamwork and problem solving the program offered.” JA programs empower students to make a connection between what they learn in school and how it can be applied in the real world, enhancing the relevance of their classroom learning and increasing their understanding of the value of staying in school. Each year, JA reaches more than 10 million students worldwide and helps them develop successful financial-management habits, empowering them to explore the potential of becoming an entrepreneur and providing them with the skills necessary to succeed in a global workforce. Locally, Junior Achievement of Western Massachusetts reaches more than 11,000 students. SHEFFIELD — Berkshire Taconic Community Foundation’s HousingUs initiative is soliciting proposals from nonprofits, community organizations, and public agencies to plan and convene outreach activities that bring residents together to explore the interrelated issues of affordable housing, economic development, and town-center vitality. Grants of up to $10,000 will be available for projects that result in action-oriented community-development strategies or create broader public awareness of the elements of healthy and resilient communities, including the availability of affordable housing. Only collaborative proposals with one lead applicant and at least one other partner will be considered. Organizations serving Berkshire County, Mass. ; Columbia County and Northeast Dutchess County, N.Y.; and Northwest Litchfield County, Conn., are eligible. The deadline for submitting proposals is Friday, Aug. 26. For more information, visit www.berkshiretaconic.org/housingus. CHICAGO — The American Medical Assoc. (AMA) recently adopted new policy recognizing the public-health benefits of paid sick leave and other discretionary time off. Citing a growing body of evidence that lack of access to paid sick leave results in the spread of infectious diseases, as well as delayed screenings, diagnoses, and treatment, the new AMA policies support paid sick leave, as well as unpaid sick leave, for employees to care for themselves or a family member. “With both dual-earner and single-parent households on the rise in the United States, it is increasingly challenging for workers to juggle family and work,” said former AMA board chair Dr. Barbara McAneny. “Workers without paid sick days are more likely to work sick and are more likely to delay needed medical care, which can lead to prolonged illness and worsen otherwise minor health issues. Lack of paid leave also has a ripple effect across a worker’s family. Paid sick leave has been shown to aid children’s health, shorten hospital stays, and reduce the risk of disease transmission by allowing parents to stay home with sick children. Paid sick leave keeps our homes, offices, and communities healthier while ensuring the family’s economic security.” The U.S. is the only industrialized nation without a federal family-leave law that guarantees workers may receive pay while taking time to care for themselves or their family. Although the Family and Medical Leave Act mandates that companies provide leave, the law does not require that it be paid. The AMA also reaffirmed existing policy supporting voluntary leave policies that provide employees with job security and the continued availability of health-plan benefits in the event that leave becomes necessary due to medical conditions. BOSTON — The Blue Cross Blue Shield of Massachusetts Foundation released a new report, “Massachusetts Residents without Health Insurance Coverage: Understanding Those at Risk of Long-term Uninsurance.” Massachusetts currently has the lowest uninsurance rate in the nation, and as part of the individual mandate to carry health insurance coverage, the state collects detailed information through its tax-filing process about the health-insurance status of more than 4 million residents. This report analyzes 2011 and 2012 state-tax-filer data and provides new information about Massachusetts residents who are prone to remaining uninsured over consecutive years. The findings can help inform stakeholders who want to maintain the state’s low uninsurance rate and strive to lower the number of individuals without health-insurance coverage. Prepared by Michael Chin of UMass Medical School and Audrey Gasteier of the Commonwealth Health Insurance Connector Authority, the analyses in this report represent the first time that tax-filer data is being used to quantify the state’s uninsured population over a period of two consecutive calendar years. No other state has such detailed information on its residents’ insurance status. 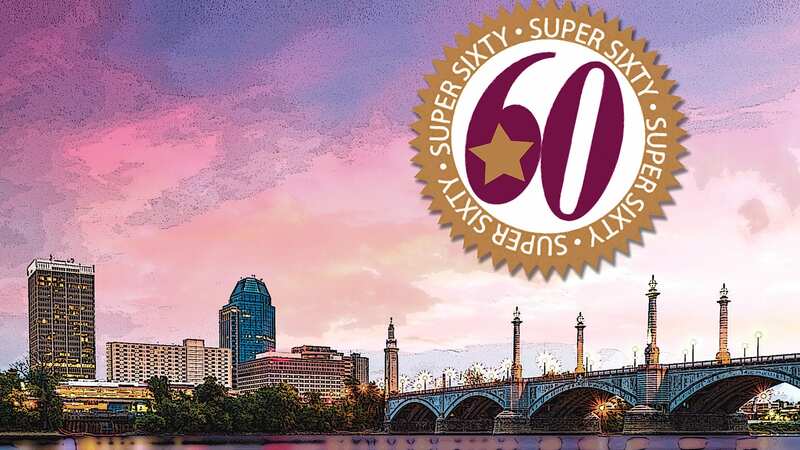 SPRINGFIELD — The Springfield Regional Chamber is seeking nominations for its annual Super 60 awards program. Nomination forms are available here or by contacting Kara Cavanaugh at [email protected] or (413) 755-1310. Nominations must be submitted no later than Friday, Aug. 12.